A talk by American University professor Deborah Brautigam. Is China a rogue donor, as some media pundits suggest? Or is China helping the developing world pave a pathway out of poverty, as the Chinese claim? 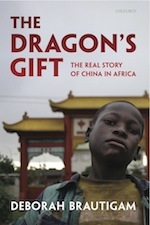 This well-timed book provides the first comprehensive account of China's aid and economic cooperation overseas. Deborah Brautigam tackles the myths and realities, explaining what the Chinese are doing, how they do it, how much aid they give, and how it all fits into their "going global" strategy. Will Chinese engagement benefit Africa? Using hard data and a series of vivid stories ranging across agriculture, industry, natural resources, and governance, Brautigam's fascinating book provides an answer. Deborah Brautigam is the author of Chinese Aid and African Development, Aid Dependence and Governance, and coeditor of Taxation and State-Building in Developing Countries. She is a professor in the International Development Program at American University's School of International Service in Washington, DC. Cosponsored by the Center for East Asian Studies. From the World Beyond the Headlines lecture series.